Hi there. My name is Ed. I’m a husband, father of three, born-and-raised Mobile native, and carpet-cleaning professional. My wife, Lesleigh, is also a Mobile native and a carpet-cleaning pro (and mother of the same three). ​I'm going to go out on limb here and guess that you have a carpet that needs cleaning in Mobile, Alabama. My team and I have cleaned thousands of carpets in Mobile over the past 18 years. ​Now look, I could go on and on about why Lesleigh and I founded our carpet-cleaning company. After all, steam cleaning carpets is our livelihood. Though you may not care too much. It takes a special person to be passionate about carpet care (and I'm a special snowflake). Instead, let's talk about you​. Is Perfect for Babies and Kittens! All you want is a clean, revitalized carpet that is refreshed, but not wet and soggy. 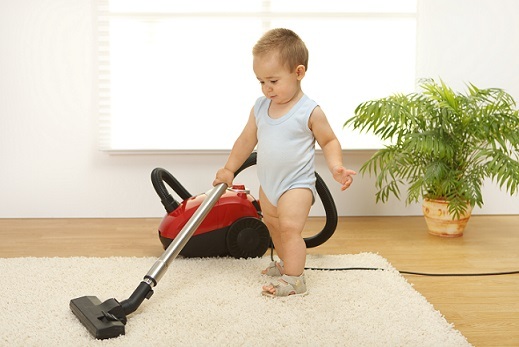 Our carpet-cleaning method is quick dry and 100% safe for babies, puppies, and kittens to play on. By the way, if you have babies, puppies, and kittens who play on your carpet after we clean it, please send us a photo. We love photos of all those things (clean carpets included!). Just for fun, here's a photo of a baby and kitten on a freshly cleaned rug. Am I on the right track? If so, take out your phone and call us. We’re at 251-220-1118. My wife, Lesleigh, usually answer the phone. You'll get along with her. 1. Detailed estimate on the phone. We’ll tell you if it’s an estimate or a final price, but if you give us enough details we can usually give you a final price on the phone to make your carpets shine again. We promise our price quote won’t go up once we get there. 2. The best, safest carpet cleaners in Mobile, AL providing you with the professional service including a well-dressed, on time, and friendly crew. I am a certified professional (certified by the fancy-sounding Institute of Inspection Cleaning and Restoration Certification) and only use state of the art, truck-mounted equipment. 3. A 10% discount off our services if you mention this website. ​We are excited to show you why we are the #1 cleaning company in here in Mobile, Alabama. But don't just take my word for it. Mobile, AL residents love the work we do in their homes. Who knew that people could love our simple company so much. There are few things we love more than hearing from our customers. So much of our business is referrals and repeat customers that we must be doing something right. Between my three children and our pets (we treat them just like members of the family) I know how dirty carpets can get. Don’t even get me started about that one time after the rainy football game with my family visiting. Lucky for my carpet, Lesleigh and I are here to take care of them after incidents like that. We even clean our rugs and upholstery regularly. You would certainly think it strange if you visited the owners of a carpet maintenance company and found carpet stains. Don’t worry, you’ll find nothing of the sort at our home. Check out some of our work in Mobile, AL! We have been cleaning dirty carpets, rugs and upholstery for a long time and take immense pride in our work serving the good people of the nearby Mobile, AL metro area like Prichard, Saraland, Tillmans Corner, Chickasaw, Citronelle, Creola, Dauphin Island, Grand Bay, Satsuma, Semmes and Theodore. Here is a small sample of our work for residential and commercial, steam, rug, and upholstery cleaning. Tough carpet stains are no more after one call to us. ​Grungy tile grout looks new and completely refreshed after one treatment from Mobile, AL's best cleaning company. Many of our customers are stunned by our results. We deliver absolute customer happiness in our carpet, upholstery, rug and tile cleaning services! Were you a nurse before launching your own business? Neither I nor my wife have training as nurses, but we are the Nurse family! Ed and Lesleigh Nurse, that is. The name Nurse’s Touch Services comes from the level of care and passion we have for cleaning carpets and upholstery (and our last name!). You have certainly heard their names. I’m not going to lie to you; they do good work at reasonable prices. But they ain’t us. We do excellent work at exceptionally affordable prices. Our goal is clean carpets, upholstery and almost anything else in your home. Not the homes of wealthy Mobile residents – your home. Our goal is nothing less than perfection, and complete customer happiness. When we give you a quote over the phone for the cost of our carpet cleaner services, that will be the price we ask for when we’re done. We promise not to raise the price when we get to your home or business. And, we offer all of your cleaning needs with just one, professional company. I am IICRC certified. You probably haven’t heard of the Institute of Inspection Cleaning and Restoration Certification because you just want your dirty carpets and rugs cleaned. Not to worry, we’re very familiar with the IICRC. In fact, we are one of only very few carpet cleaners in Mobil, AL certified by the IICRC. The IICRC sets high standards for carpet and rug cleaning. We have state of the art, truck-mounted carpet cleaning equipment that allows us to remove some of the most difficult grime and stains from your carpets. In short, we live and breathe carpet cleaning. Keeping carpets, upholstery, and rugs clean is our passion and our livelihood. We are here to serve the great people of Mobile, Alabama, and keep their rugs and carpets clean. We love serving the greater Mobile, AL metro area. Cities include Prichard, Saraland, Tillmans Corner, Chickasaw, Citronelle, Creola, Dauphin Island, Grand Bay, Satsuma, Semmes and Theodore. Our bread and butter reason-for-company-existing is carpet cleaning. Additionally, we offer rug and upholstery cleaning, power washing, house washing, and deep cleaning. Our goal is to allow the residents of the greater Mobile, AL metro area to get all of their cleaning needs at one place instead of going to many different cleaning companies. Our goal is to keep your home squeaky clean, inside and out. How much is all this cleaning going to cost me? Well of course it depends on the size and scope of the project. When you call us we will ask you for the number of rooms, hallways and whether there are any stairs. If you know a rough square footage, that’s awesome (but not necessary). We are going to ask you if there are any problematic stains on the carpets, upholstery or rugs that we will need to be aware of. With this information, we’ll be able to give you a free quote. There are no strings attached, and no pressure (unless you asked for an estimate on pressure washing… sorry, couldn’t help myself with the puns). And absolutely no raising the price later on like some other businesses you have worked with in the past. Call 251-220-1118 to chat with me about your needs and schedule a day and time that work best with your schedule. How could we be the passionate carpet cleaning people that we are if we didn’t? We aren’t only proud of what your carpet will look like when we’re done. We will cover the warranty in our straightforward, simple terms that you will understand when we come out to clean your carpets or rugs. We even offer a maintenance program where we will come out on a regular basis to keep your carpets spotless. Do you use harsh, dangerous chemicals to clean? Wow, getting right in there, huh? I understand your concern. You’re worried about letting your baby crawl around on the carpet, while taste-testing our work. Well, I assure you it is safe, green and free of dangerous, harsh chemicals. I understand your concern perfectly, with three children of my own who all grew up on carpets cleaned by us (you didn’t think we would hire someone else to clean our home, did you? Of course we only trust ourselves because we’re the best carpet cleaner in Mobile!). Simple: just give us a call at 251-220-1118. Or, if you would prefer email scroll up to the contact form and fill it out. Signed by unquestionably the most passionate carpet cleaning professionals in Mobile, AL. P.S. Feel free to call us day or night. Whether your project is commercial or residential. Whether you are a homeowner, or have a hotel, or apartment or apartment complex. If you are interested in a one-time cleaning, or want to sign up for a monthly maintenance program and not worry about it again. The great people of Mobile, Alabama trust us with their hard-earned money to clean their carpets, rugs and upholstery of all shapes, sizes and colors. With us there is no stress, no mess, no soggy carpets and rugs, no dangerous or harsh chemicals. We are fast, demand perfection in ourselves and our staff and we leave your carpets revitalized. Wondering What an IICRC is? ​How Do Carpets Act As Air Filters? ​Why Are Professional Cleaners Better than Rentals? ​What Do Bald Spots In Your Carpet Mean? ​How Often Should You Clean Your Carpets?